Twitter and Amazon have tied hands to let the users of Amazon buy things from their website by just using a hash tag called #AmazonCart. 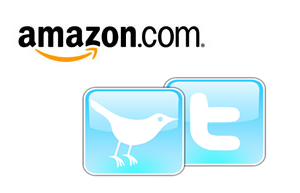 This new feature will allow users to link their Twitter and Amazon accounts with each other. It was natural to discover new products and services on Twitter and Twitter is always looking to make things easier for their users.Will Stickney, Twitter`s Spokesman stated in an interview. The term`s of the deal has not been announced as of right now. Amazon announced this new feature by a tweet, this is an exciting new feature for users to add things to their shopping cart without leaving the twitter accounts. This is a simple process, the users just need to locate tweets of their preferred artists, bands, experts or friends with the link of the product from Amazon and they just have to reply with #AmazonCart and that product will get added to their Amazon cart but only if the user has connected his/her Twitter account to Amazon`s site. If not then they will get reply to connect these two accounts, after doing so they`ll get to use this new feature. Julie Law Amazon`s Spokeswoman elaborated. Users can also visit the Amazon`s website and get started on how this new feature works. In the US and Britain this service is known as #AmazonBasket. However, there could be some privacy issues, because most tweets are public and who has bought what could be visible to everyone on Twitter.